Rotorua wedding video, Nuance photography absolutely love when we get great feed back from our clients. Just over a year ago we were privileged to organise the complete wedding for a truly lovely couple all the way from Australia. They chose Rotorua for their wedding and we were able to use some of Rotorua’s world class attractions to showcase their wedding imagery. Ashley and Scott contacted us regarding a cute and intimate wedding in Rotorua. 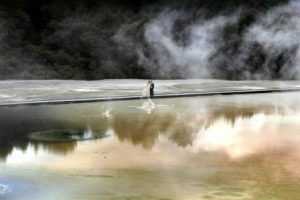 They wanted a hassle free Rotorua wedding and asked if they were able to use Wai-O-Tapu which is a fantastic area full of geysers and natural hot springs. It also boasts a huge geyser that shoots up to 30 meters approximately every couple of hours. We took things one step further and managed to get the couple a golf cart to make the most of our time. 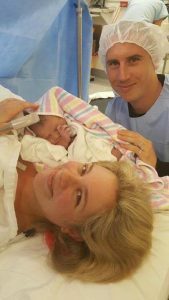 We also arranged their NZ registered marriage celebrant, their bouquet, button hole and flowers, lake front accommodation and fine dining. We were luck enough to also capture some lovely video footage and drone however the wind in the afternoon put a stop to drone photography. We really tried to include as much as Rotorua has to offer in thier images so they could return back to Australia and show off their New Zealand holiday! As local Rotorua wedding photographers, we photograph the amazing surroundings and we always try our best to get photos in a few top Rotorua locations. Our favourites for dramatic wedding photography is The Redwood Forest, The Blue Lake and the Rotorua Lake front. We also have a few other top spots that are great to show off the natural environment such as the thermal area behind the golf course. This lake front area has a whole heap of geysers, thermal holes and mud pools we can use as a dramatic backdrop. If you are getting married in Rotorua and would like amazing wedding photos and video contact us now. Remember we can arrange your complete wedding and only use the best suppliers and venues locally.